Thank you for all the well wishes on my previous post! Your kind thoughts were successful as my sense of taste returned just in time for a dinner of delicious chicken of the fried variety. I was also able to control my leaky nostrils for brunch with the truly lovely and most enjoyable breakfast companion Ginny of GinnyBranch fame. I left our meeting grinning unabashedly at having met such a jewel of a lady. One of the changes I had planned to make on this blog was to avoid future updates featuring me wearing hats or sulking in front of my wall (will continue those vainglorious activities on flickr) but I'm making a special exception with this entry to announce the upcoming launch of our ebay store! I'm sharing the date with you because I will then be held accountable to honor that date (which I am unlikely to do if left to my own devises which include plenty of food procrastination, watching Emma Thompson movies and trying to push my teeth into a straight line with my thumbs - a so far unsuccessful venture). The date is March 21st, which along with being national teenagers day, children's poetry and single (I had written "singal" and couldn't figure out why dotted red lines were telling me I was wrong, perhaps should sleep and not write in blog while on nighttime medicine) parent's day is also the first day of spring (though wikipedia says otherwise). 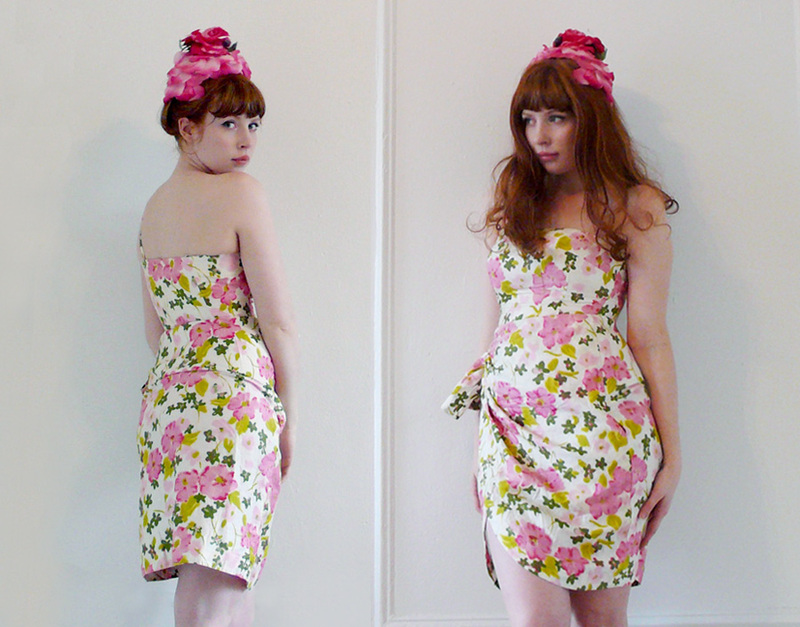 In celebration I've picked out a selection of spring-like attire including the dress above. In truth I'm a bit nervous about the whole online selling business - I feel not unlike grandparent's trying to navigate this new (to me) technology. My experience buying online is quite limited so selling will be interesting. While on the subject of internet selling I want to introduce you to an old friend of Landon named Tiffany! Tiffany runs a shop on etsy called Kitten Paws Vintage where she sells a delicious selection of hats and gunne sax. 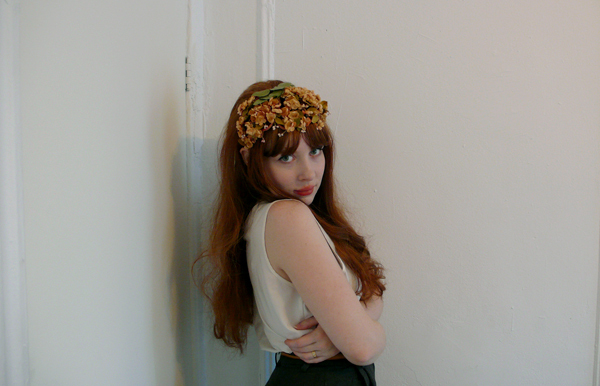 I was lucky enough to nab the perfect floral hat pictured below from her shop. Thank you Tiffany! hannah! I am so so excited about your ebay opening! I don't think you should totally call off your hat sulking photos! I love them all and you are the one who even got me into my hat collecting (the hat queen). Any who best of luck! friggin'! what the hell, hannah. Yes! Ebay! A new addiction to my already bad shopping problem. And you look like a forest nymph in this photo..lovely. That's wonderful and I'm sure it will turn out well! Good luck! Don't stop posting pictures of you with hats, I love them!! I'm so excited about your ebay shop Hannah! I hope I've got some money left for the grand opening! I seriously envy everything that you wear on here. Hi Hannah--I love your blog & I say keep posting vainglorious photos of yourself! They are so beautiful and hats are so wonderful. In grade school, I thought vainglorious meant gloriously brave because I thought 'vain' and 'valor' were the same word, and I think I raised my hand and said something like, 'MLK is the most vainglorious man in history!' Oops. I can't wait to see what vintage treasures you have in your Ebay store. Red looks so pretty on you. That hat is perfect! You look like a forest nymph. (Oh, someone else said that. I second it.) Can I follow your blog with blogspot or just bloglovin'? I could not see an appropriate button. Oh Hanna, you always manage to make the moment one returns back to your blog feel like the highlight of the day so far. You, Landon, your home and your whimsical way is just so amazing and brings a smile to my face. Please don't stop the hat-postings! Owh cool! and your pictures are not sulking in front of your wall They are all very lovely and beautiful!!! My grandmother has beautiful dolls dressed in the prettiest little dresses and hats that I just adore! Your look is very similiar to those stylish dolls! I really love it! your floral headpiece is so wonderful! best of luck with the launch of the eBay store (I have one myself), I can's wait to see it in action! Oh, and it looks like the red locks are back in full swing and they are fabulous. I like the hats you wear, so don't stop posting. Ah i can't wait for your e-bay store, i have my fingers crossed that you'll be including some gorgeous headwear. sigh. your floral hat is love. i recently got one similar but with less flowers and in red. i will think of you when i wear it! Best of luck with the ebay venture! From what I can tell from reading your blog for years and years, you've got heaps and heaps of sweet little finds, and I am glad you're getting to share it with the world! Have you also ever considered also testing it out on etsy? Perhaps trying both worlds out to see which one fits you the best. I ended up opening a shop on etsy (http://www.thedootdootstore.etsy.com) because it suited the way I like to work (listing when I feel like it, being able to keep the listing for months, having limited graphic design abilities) and I really appreciated the aesthetic. That being said I'm sure you're going to do a stupendous job wherever your shop lands on the internet!